Despite applications with failover capabilities in place, a failed server in Gatwick Airport’s IT infrastructure—whether physical or virtual—still exposed Gatwick to the risk of downtime and data loss. Not to mention, the highly redundant infrastructure that they created to avoid the risk of downtime was itself struggling to maintain the availability needed. Restoring a VM with their file-based backup tools took hours. 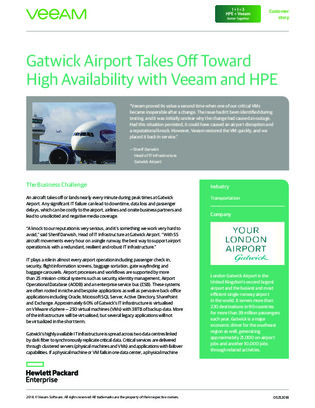 Read this case study to see which rapid VM recovery tool Gatwick procured to avoid the risk of downtime, data loss, and passenger delays that previously beleaguered them.